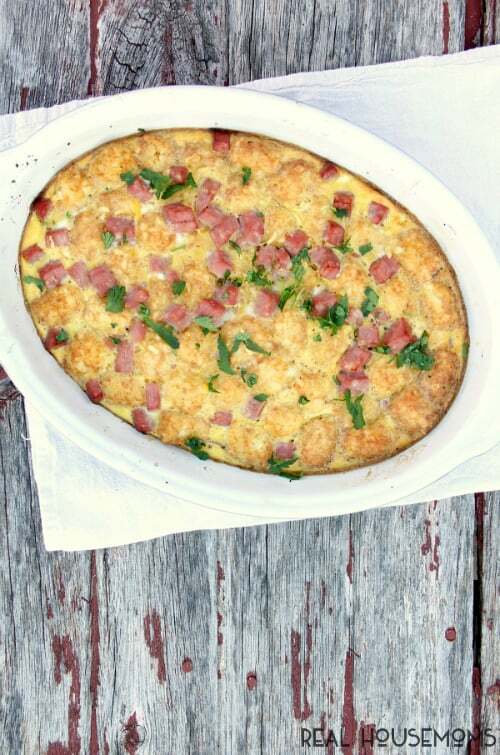 Brunch has never tasted so good, this BREAKFAST HAM CASSEROLE is devoured and everyone always asks for seconds! I love using tater tots (instead of uncooked hash browns) in my breakfast easy casserole recipes. They stay super crispy and crunch even after they bake up instead of just a non-crispy potato in the bottom of the pan. Trust me…it’s amazing! And the kids will go crazy knowing that you are willingly serving them tater tots for breakfast. This is my go-to breakfast after the holidays because it’s super easy to throw together after a long day of cooking, plus is uses up leftover cooked ham. Or, just buy some cubed ham in the deli section and make this yummy breakfast all year long. Isn’t it beautiful? I bet you wish you could dish up a big plate of this casserole today! Make sure you check out more Easy Breakfast Casseroles or my Tater Tot Breakfast Casserole! 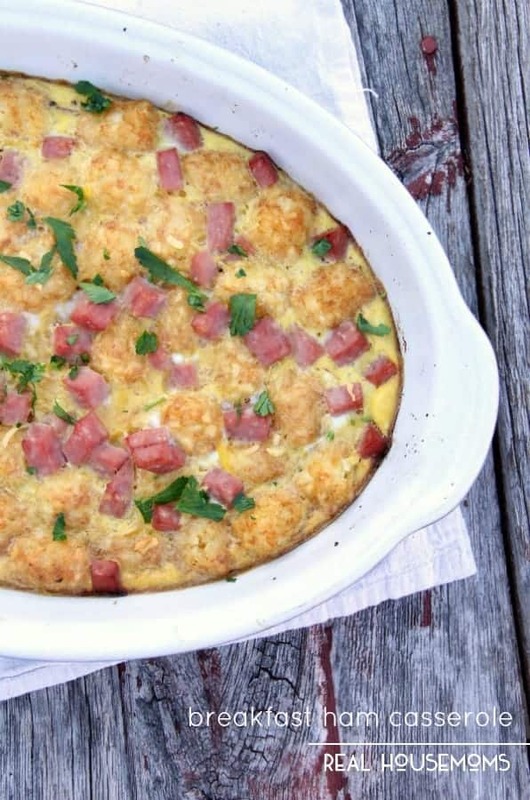 Brunch has never tasted so good, this Breakfast Ham Casserole is devoured and everyone always asks for seconds. Preheat oven to 375F. Spray casserole dish with non-stick cooking spray. Put ham and tater tots in a casserole dish. In a medium bowl, combine remaining ingredients and mix well. Gently pour over the tots and ham. Cook for 45-50 minutes or until eggs are fully cooked. Garnish with a little chopped green onion, if desired. It looks like a great recipe, however in the directions, it mentions sausage. I don’t see any sausage listed in the ingredients. Can you clarify? Thanks! Whoops, the instructions have been corrected. You can also do this recipe with sausage it just got a little mixed up. Hope that clarifies. I believe the carb count is incorrect as one serving tater tots has 20 carbs. We recalculated but remember there is only 16 ounces of tater tots being used and this yields 8 servings.